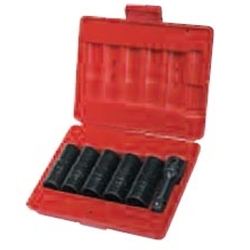 Six Piece Double-Duty Flip Socket Set Ken Tool 30111 / BOWES KT 30111. One end is a standard 6-point socket for everyday use. Flip socket over and you have a 6-fluted twist socket for removing damaged or rounded wheel lugs.